Borislav and a friend worked together to train their bodies, to repair the damage of sedentary activities. See how he found a physique worth flexing! First, let me start by telling you how I got in the gym. My dad is a former wrestler and lifeguard and he has always wanted me to exercise. In 5th grade I took up flat water kayaking but gave it up after a year. By the time I started 8th grade I was overweight because of eating junk food and playing computer games. I decided that I had to do something and change my life. 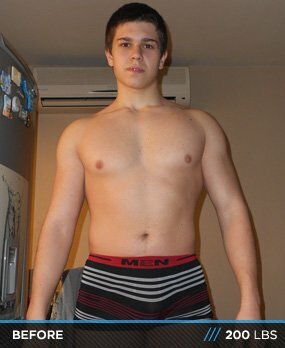 I went on a crash diet and dropped from 187 lbs to 165 lbs. I started jogging and kayaking again. I was looking for a way to improve my physical condition and a teammate suggested joining him for a session in the local gym. I still remember my first chest workout doing 5 exercises for 3 sets each literally killing myself. I fell in love with the weights. I started reading about bodybuilding, training, nutrition, etc. Soon I found out that I cared more about how I performed in the gym than in the water. One year later I quit kayaking and from then on I've been working out only in the gym. Now that I've introduced you to my story let me tell you that I wasn't persistent with my training in the gym. For more than two years I'd been training inconsistently, jumping from one training program to another, listening to "locker room" advice, eating fast food, not getting enough sleep, etc. - basically doing everything I could to sabotage my gains. Until I got fed up with all this! The turning point was at the end of 2011 when after looking at my body I realized that I really wanted to live healthy and look good. Why would I go to the gym if I didn't see results? I wasn't that stupid. I wasn't going to be like those dudes who go to the gym just because they are bored or have some spare time and don't know what to do with it. And that's why I got started. To prove to myself and others that I am different and when I say something I do it because goals without actions are dreams! I decided to start a new life after New Year's Eve. I wanted to live healthy and look great with my shirt off. Now I needed a plan for action and I started researching. I was surfing the net like crazy, reading articles, journals, subscribing to fitness gurus, reading books, etc. It didn't take me much to learn the basics and I was getting more and more knowledge. I became educated! I learned what mistakes I had made in the past and now I knew how to fix them. It wasn't that hard because I started with the idea in my mind that I didn't have to reinvent the hot water, I just had to find someone who has had the success I seek and copy what he's done to achieve it. That's how I found role models like Rob Riches, Greg Plitt, Amer The Hammer, Kelechi Opara, etc. Actually Rob Riches is the man whose blog I've used to design my training, nutritional and supplementation programs. His personality really inspires me! But anyway the time passed and soon it was New Years Eve! It was time to start my transformation. I started on January 3rd by making the commitment to totally transform myself till the end of April and here I am today after four months of hard work, sweat, tears and countless struggles. Through proper dieting, training and supplementation patterns I've achieved the body of my dreams. It wasn't easy but it was worth it! Basics, basics, basics. It's all about basics and you don't have to reinvent the hot water when it comes to supplementation. Supplements make the smallest change and should be used only when your diet and training are on 100%, and ONLY then you should use a handful of them. I primarily use supplements for convenience. For example I use protein powder because it's much easier to make a shake than to grill a steak and in a century when everything is about time I prefer to use my time in the most useful way. So here are the few supplements I believe can be useful and when I use them. My approach to nutrition is pretty much to stick to the basics. That's pretty much everything. Nothing special. I just taper my carbs down or cycle them 3 days low-carb/1 day high-carb when I'm trying to coax some fat. I also use lots of lots of spices which I believe supports the immune system and boosts my metabolism. Sometimes I have canned tuna or any other meat. The price is the limiting factor for me, not the type of meat. I believe in the calories in calories out rule and I'm not afraid of fat as long as I meet my daily caloric requirements. My advice to others is to not go crazy with supplements and try to master your nutrition first! If you eat the right foods at the right time, provide the required stimulus for the muscles to grow and take enough rest and sleep to recuperate your progress is sealed! But of course it takes time. More or less. Everyone is different and different bodies react and change slower and faster. All in all, train hard, eat smart, rest enough and expect success! That's all I can say! Best wishes to anyone who's on their way to achieving their dream body and changing their life forever!